Eleven years of work produce a thoroughbred. Roccat has produced something precise, controllable, and customizable: a solid product that’s almost entirely gimmick-free. 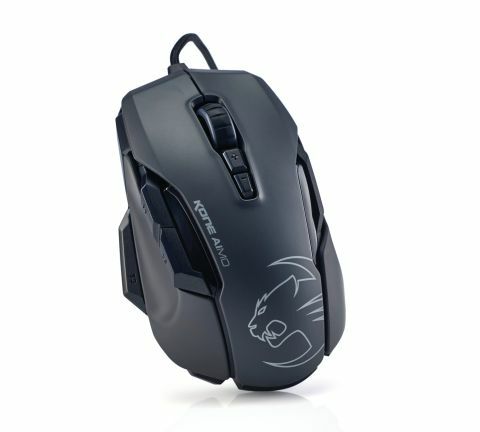 German firm Roccat has been making Kone gaming mice since 2007—the original was the company’s first product, and it was the first mouse to include multicolored lighting. So, now we know who to blame. Roccat is pushing the lighting hard with this model. It “truly travels at the speed of light,” gushes the promotional material, something Mr. Einstein might like to have a word about, but there’s no getting away from the brightness of the lighting in the Kone AIMO. You’re never going to lose this one in a darkened room, and with a 32- bit ARM chip running the show to ensure responsive handling, plus 512Kb memory onboard, there’s no reason you’d want to. The body is thick and curvaceous, pressing firmly up into your palm, and with a deep groove on the left to accommodate your thumb, a ridge at the rear holding it in the perfect position to flick up over the pair of buttons positioned above. The right-hand side is similarly contoured, allowing your ring and pinky fingers to gain significant purchase. Two more buttons nestle behind the wheel, which is broad, and with just enough ridging on its tire—any less would leave it prone to slipping, and we’d like to see a little more. The wheel tilts and clicks nicely as it goes around, but again, we feel it’s holding back and could clunk more firmly into place—that’s not to say it’s going to be possible to move it by mistake, just that it feels a little limp. For us, it could be positioned a little further forward on the body, too, but most will be pleased with the way it feels. Switches are Roccat’s own, with a 50-million-click lifespan, and each button feels responsive, with no sticky movements or shallow actions making you wonder whether your press registered. The Kone AIMO’s big selling point is its lighting. With a lit wheel and two stripes that run along the length of the body, it’s almost restrained by modern standards, and produces an attractive glow from between your fingers while in use. It’s certainly bright, not losing any of its luminosity as it cycles through colors. AIMO itself is an “intelligent” lighting system that reacts to the way you use the mouse, and is “enriched” (no, us neither) by the apps you use. It does all this in quite subtle ways that are difficult to see when you’re concentrating on what you’re doing and your hand is blocking most of the light. Other lighting modes, such as simple color shifting or “breathing,” are also available from the Roccat software. Whether you get a kick out of intelligent lighting or not, controlling it all through the Swarm software is a breeze. Once it finally finishes updating and installing a new module for the Kone AIMO, Swarm has settings for just about everything, from button assignments to sensor sensitivity (hilariously called the Owl-Eye, it’s a 12,000 DPI Pixart 3361 optical sensor that Roccat has tinkered with) and lift-off distance, plus a simple but clever shifting system that defaults to the bottom thumb button, and easily moves to a second programmed set of button assignments. Five profiles can be switched between, and there are macros, too, with built-in profiles for some of the best games of 2016. It’s a comprehensive package, and we’d have been disappointed with anything less. The Roccat Kone AIMO is a mouse that does so much right that any criticisms of it are mere niggles. At its price point, the AIMO is taking on the likes of Razer and Logitech, and would be punished for any missteps by losing sales. Roccat has managed to produce something precise, controllable, and customizable (you can even bring back the glory days of the Microsoft Intellimouse by enabling mouse trails, if that’s what tickles your fancy), and it’s good to see a company produce a solid product that’s almost entirely gimmick-free.